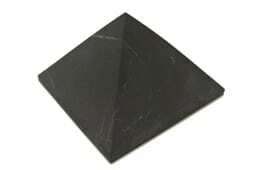 Shungite is a lightweight yet hard stone with a deep black finish. Shungite is also a specific form of carbon that is created by the geologic processes that transform crude oil. While the stone has a gained a reputation for having magical properties by those who sell crystals intended for crystal therapy, geologists know that its properties make it useful for things like paints, plastic fillers, and steelmaking. Shungite is classified as a mineraloid due to the fact that it has no discernable regular molecular structure, and it is representative of some of the oldest oil deposits on Earth – those originating in the Precambrian era. Shungite bears a resemblance to asphalt, being dark grey and hard/lumpy in texture. It also looks rather like anthracite coal. Shungite is classified as a pyrobitumen, which means that the substance doesn’t melt. If put over a hot flame shungite will splinter and emit a tar-like odor. Shungite can vary in luster and hardness, depending on the quality of the sample. 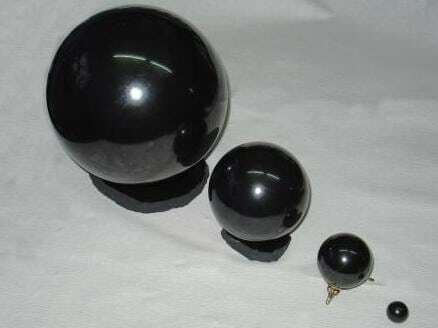 The natural presence of fullerenes (a form of carbon that resembles a hollow sphere) in shungite is rare and only observed in a few specimens of shungite. Even then the quantity of the fullerenes only accounts for a few percents of the material at most. Another notable thing about shungite is that doesn’t have an easily definable molecular structure, possessing only a vague structure. It doesn’t display any crystallization like graphite or diamond does. The fact that Shungite doesn’t display crystallization makes it a mineraloid. Mineraloids have chemical compositions that are beyond the accepted limits for certain minerals, and this fact means they don’t crystallize. Obsidian is another mineraloid, being volcanic glass and not a crystal. Other examples of mineraloid are ebonite, jet, opal and various tektites. Tektites are formed by meteorite impact and the circumstances of their formation mean they lack crystals, much like shungite. The term shungite was initially used to describe mineraloids that are made up of more than 98% carbon, though this term has become more loosely applied since it was originally coined around 1879. Rocks with shungite in them are classified based on the amount of carbon they have in them, with Shungite-1 having a carbon concentration of around 98-100 weight percent. Meanwhile, Shungites 2, 3, 4, and 5 have carbon concentrations around 80% to 35%, 35% to 20%, 20% to 10% and less than ten percent, respectively. Shungite appears either disseminated within the rock that hosts it or as migrated/mobilized material. The shungite that migrates is thought to be representative of migrated hydrocarbons and can manifest as either vein shungite (veins that cross-cut through the rock layer) or layer shungite (layers that conform approximately to the layers of the host rock). Shungite was discovered in the Russian republic of Karelia around the Lake Onega. Specifically, a large deposit of it was located at Zazhoginskoye, which is what gives shungite its name. The Zazhoginskoe field is located around 2 kilometers from Lake Onega and around 5 kilometers from an accessible bay. The field is around 22 kilometers by 11 kilometers, and the village Tolvuya is located within the territory of the deposit. The deposit is not only full of shungite rocks, it is also interleaved with deposits of siltstone, dolomite, and tuffs. Igneous rocks constitute approximately 30% of the productive region. 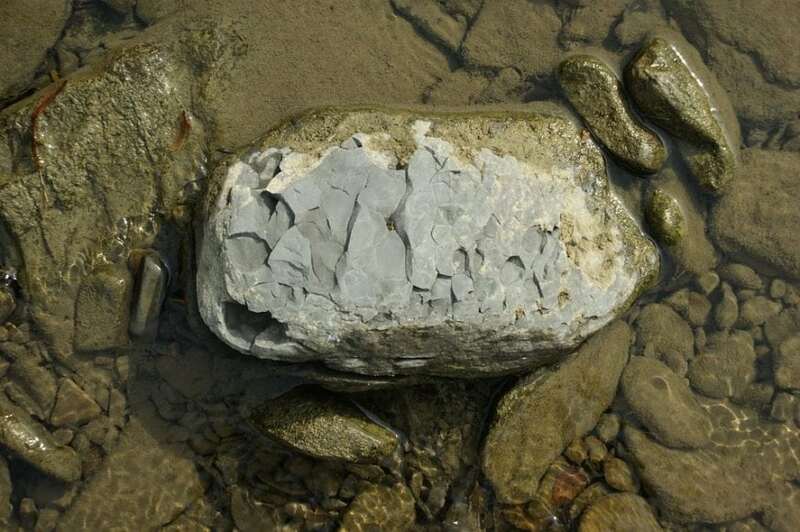 There are 25 different deposits identified by geologists, and they have been explored to various degrees. The chemical composition of ore pulled from the region is around 30% carbon, 45% quartz, 20% complex silicates and 3% sulfides. Another substantial occurrence of shungite is found at Vozhmozero. The rock formations in this region are from the Paleoproterozoic age, which occurred around 2 billion years ago. These formations include what remains of a massive petroleum province that contains both crude oil bodies which have migrated out of shale rocks and shale source rocks themselves. Geologists believe the area was at one time covered by large, shallow lagoons that bordered a volcano chain. The lagoons hosted masses of simple, one-celled algae and the volcanic activity in the region provided the algae with nutrients that let them grow. Sediment from the volcanoes buried the remains of the algae and over time the heat and pressure from the Earth condensed the oil and transformed it into a substance that was almost pure carbon. Stratified deposits that contain shungite keep their sedimentary structures, and it is thought that these metamorphosed from oil source rocks. Shungite was long used by citizens of Russia as a medical/health substance. Since the 1700s shungite has been used to purify water and to disinfect things, in a similar way that activated carbon is used. These legitimate uses have been distorted and lead to a situation where poorly supported claims about shungite’s medicinal/therapeutic properties have been spread around. One of the largest producers of shungite is Carbon-Shungite Ltd., and the company supplies industrial companies with shungite for use in the creation of paint pigments and rubber or plastic fillers. Beyond this, shungite is also used to treat water and to make steel. Carbon-Shungite is used as a substitute to carbon black and metallurgical coal. In terms of the shungite deposits, it is believed that there is around 250 gigatonnes of shungite located in the Shunga deposit. This shungite is located with a section of the Palaeoproterozoic metavolcanic rocks and metasedimentary rocks. These deposits have been dated to around 1980±27 Ma. The Zaonezhskaya Formation is home to nine different layers that bear shungite, and the thickest out of all the shungite layers is layer six. This layer is called the “productive horizon” due to how thickly concentrated the shungite deposits are in this layer. The four main deposits in the Zaonezhskaya Formation are the Nigozero, Zazhogino, Maksovo and Shungskoe deposits. The Shungskoe deposit has been thoroughly studied and most of the accessible shungite has been mined out.